The City League Championship is Saturday at Connie’s Ric Rac (1132 S. 9th) and full details about that will be posted later today.Â It will also be e-mailed to you in your invitation if you qualify, so if you have yet to supply an e-mail address please do so by contacting urbanus(at)rpscityleague(dot)com. Total Points – This is going to be either Billy Shears or Loomer.Â No one else is within 20 points of them, which is the most points available to a single player tonight (16 for a tournament win + 4 for a Street win).Â Billy Shears is currently up by 4 points.Â They have dominated this season with a combined win percentage of 72.66%. Rookie of the Year – There are technically four players in contention here.Â Dr. Hambone, Esq. has a really good lead but can be caught if things align correctly for the others.Â If Dr. Hambone plays and loses in round 1, he will have 59 points.Â Then B-Pac can catch him if he either 1) wins at the Dive 2) is the runner-up and the Street RPS winner or 3) both wins the tournament and the Street.Â This is a tall order to fill.Â Biggs Darklighter has the same chances and needs the same things to happen.Â Both can still win RotY if Dr. Hambone, Esq. is eliminated in round 2 (+4) but then the only option for them is to win both the Street tourney and the regular tourney.Â Madam Silly Putty can move into the lead if Dr. Hambone, Esq. doesn’t show up at the Dive and she wins the tourney and Street. 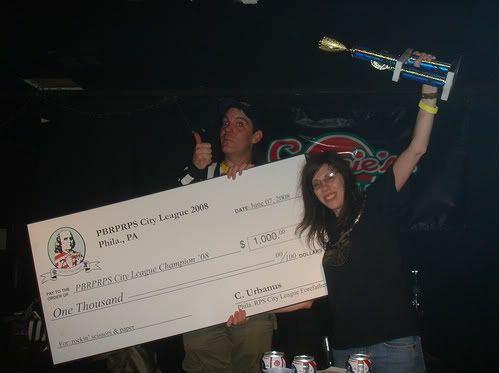 Street RPS Champ – This is essentially between The Fighting Mongooses and Frankie 13 at the moment (471-409), but the PBRPRPSCLCS Executive Committee is still undecided about how much Street money will be issued at the Dive.Â If it is increased, then there still may be a chance of some other players such as Dr. Hambone, Esq., Grim Trigger and Scissors Blizzard to find a way to make it to the top. Team Points – This has already been claimed by the Majestic 12, as they have won 12 of 22 tournaments this season.Â Incredible.